Just in time for Christmas, head on over to Give1Save1 to bless a family that is adopting twin boys from Ethiopia! They have a sweet video that tells their story, and you won't want to miss it. The donate button is over at the Give1Save1 blog. Are you new to Give1Save1? The concept is simple, but profound. Here's what they're all about in their own words. Every Monday I’m going to ask you for a dollar. I’m going to tell you who it’s going to and what it’s being used for. We’re mostly funding adoption for the people, by the people. We’re just going to rain down a crazy blessing on a family, organization, orphanage, or project and we’re going to do it every week. We’re going to get huge. And the world will be changed for lots of people because of your generosity. That sounds exciting, doesn’t it?! Let’s do it. I'm a little behind this week. But had to share this week's Give1Save1 featured family, the Seiferts. Still two days left to donate a few dollars this week. Ready, set, go! How exciting to add my few dollars to many more donations and see the Owen Family get closer to bringing 2 little girls home from the Democratic Republic of Congo. Seeing this family's video over at Give1Save1 was inspiring -- dad is deployed right now, and mom of 3 boys is bringing 2 girls home on her own! Wow! Head on over to Give1Save1 and add your dollar... every drop adds up. Another family (we knew the mom in college) is adopting 2 children from China! Check out their story on their blog. They just opened an online store that will directly benefit their adoption, and if it takes off, they hope to be able to bless other adopting families in the future. Check it out as you start your early Christmas shopping. You know Christmas is only 97 days away, don't you?! End of the day update: The Owen Family at Give1Save1 has been blessed with $1,927 already!! It's Monday again, which always has me curious as to the newest family over at Give1Save1. Head on over there to bless the Hatfield family this week as they bring 2 kids home from Africa. 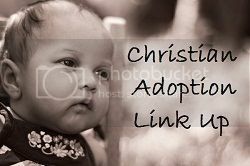 A friend shared this Adoption Link Up at the Satisfaction Through Christ blog. It looks like a great way to be encouraged and to learn more about the adoption process through other families that are on this journey too. And finally, just wanted to say that our home study visit on Saturday went well. We have two more this month, and then we're done with that part of the process! Next step: Dossier to Ethiopia!! Moving right along! It's a brand new week... there's a new family over at Give1Save1 for you to encourage with $1 (or more!). Make sure you watch their video ~ very fun! "Adoption is the gospel with flesh & blood." So true. Such a visual. Starting out the week with this truth brings great thankfulness and hope! We're finally ready to have our first home study visit! Most of our paperwork is complete. Just waiting on our background checks from Canada to come in. When our home study is complete (6-10 weeks? ), we can send our dossier to Ethiopia. During that waiting time, we hope to begin applying for grants and an interest-free loan. So pray that the visit on Saturday will go well. Thanks!